A dominant Blyth Spartans did just enough to see off third-placed AFC Telford United in a thoroughly gripping Manarama National League North encounter – after both sides were guilty of missing a host of chances in front of goal. The home side scored the only goal of the game when Daniel Maguire headed home in first half stoppage time to claim all three points, but they could – and probably should – have put daylight between the two sides well before they finally found the back of the net. Spartans continued to be thwarted at every opportunity after the break and had to see off a spirited fightback from Telford – who wasted no less than three golden chances in the dying embers of the game – to claim just their third league win of the season. After his Emirates FA Cup Second Qualifying Round heroics in Tuesday night’s 1-0 win over Nantwich Town, match winner Maguire made a return to the starting lineup for the visit of third-placed Telford – alongside Spartans skipper Robert Dale. Alun Armstrong’s only other change saw Ian Watson come in for Michael Liddle at left-back. 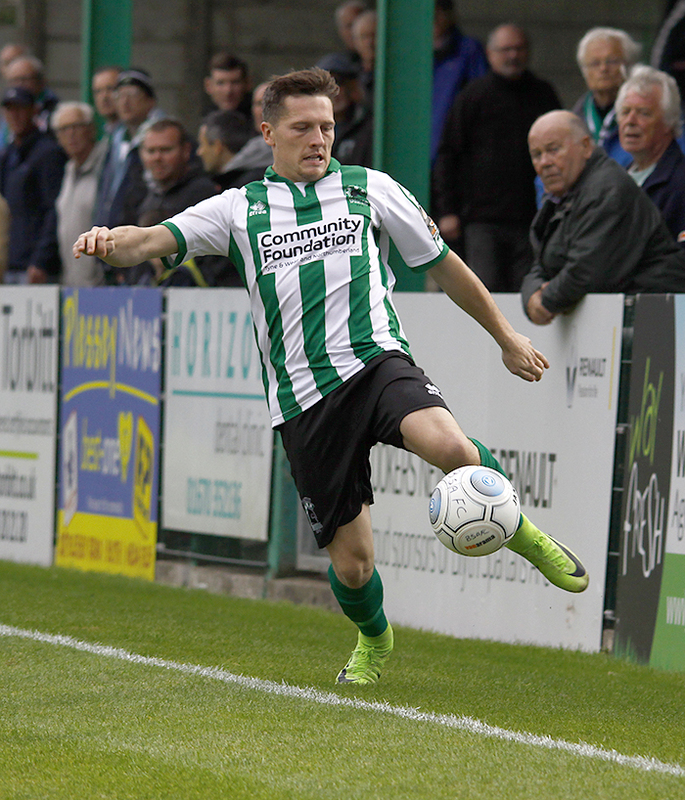 Despite the visitors’ lofty league position prior to kick off, it was Blyth that applied all of the early pressure – as the hosts had no less than four chances inside the first ten minutes. Jamie Holmes cut inside and had a crack with just three minutes gone, but his shot was blocked by the legs of Theo Streete. The forward got in down the left again two minutes later, but snatched at the chance with teammates waiting for a cross. Kieran Green bobbled a volley across the face of goal nine minutes in, but failed to test Max Bramley. The United keeper had to be at his best to thwart Dale 60 seconds later though – as he dived high to his right to stop the 33-year-old’s curling free kick from finding the top corner of his goal. Dale got another chance to better the Telford stopper just after the 15-minute mark, when he took his marker the wrong way and shot at goal. Bramley was able to deal comfortably with the shot, which was straight at him in truth. The Blyth captain turned provider four minutes later, when his corner presented birthday boy Nathan Buddle with a free header. The defender was unable to start his celebrations early though, as his header across goal fizzed just wide of the far post. Spartans had enjoyed total dominance in the opening half-an-hour and really should have went ahead when Maguire stroked a cross into Dale six yards from goal. The Spartans Hall of Famer looked destined to score when he slid in to meet the ball, but – to the dismay of the Croft Park faithful – he couldn’t divert it into the back of the net. The away side had the chance to punish Spartans’ wastefulness when their first chance finally came with ten minutes of the first half remaining. Matthew Barnes-Homer was presented with a free header in the Blyth box, but could only balloon it high over the bar when he really should have done better. Normal service resumed soon after, when Adam Wrightson played in a great cross to the head of Green. The midfielder could only head wide though, while a desperate Maguire was unable to stretch enough to get a touch on the ball to stab it home. Just when it looked like it was going to be a frustrating wait at the break for Blyth, the home side finally broke the deadlock in first half stoppage time for a deserved lead. Wrightson – who had caused Callum Cockerill-Mollet nothing but trouble from the first whistle – crossed in from the right and picked out a waiting Maguire, who gratefully nodded home with ease for his second goal in as many games. After being booed off at the break by the Blyth fans, referee Elliott Swallow emerged to cheers for the second half, albeit sarcastic ones – after himself and assistants Martin Conroy and Jack Gordon walked out for the second half having left the two teams waiting for a significant amount of time. Spartans looked to continue in the same vein not long after the restart when Dale’s floated free kick was cleared as far as Green at the edge of the area. The former Gateshead man cut back onto his right, but his low drive was blocked away by the body of Streete. The hosts then had a shout for a penalty in the 49th minute, when Maguire went down in the box. Swallow waved them away almost instantly, but his his decision had clearly stuck in the throat of Armstrong – who was left incensed on the sidelines at what he was seeing. United’s dugout were up in arms themselves for the same reason three minutes, when they felt Cockerill-Mollet had been blocked off inside the area. Swallow’s decision only helped to further cement his position as pantomime villain for both sides for the afternoon. Four minutes before the hour mark, Blyth were just inches from doubling their lead once again, when Dale sprayed a ball out wide to Holmes. The forward launched a low driven ball across the face of goal for Maguire to turn home, but “Nipa” was once again just short of getting the necessary touch he needed to convert. Dale tried himself once more from another free kick on 62 minutes, but he couldn’t keep his 20-yard effort down. United began to gain more of a foothold in the game and really should have been level with 19 minutes remaining, when a missed interception from Buddle saw the ball run through to Amari Morgan-Smith. The substitute opted to pick out Ellis Deeney with a ball back across, but the midfielder was denied fantastically by Jordan Watson’s block. The Irish centre-back had no time to pat himself on the back though, when a dangerous away break looked destined to produce a leveller for Telford four minutes later. Man of the match Watson dived in brilliantly not one but twice to dispossess the visitors and save yet another certain goal. It’s fair to say that Spartans were riding their luck at the back at this point, but United still couldn’t find a way through – even when it was presented to them on a plate. Morgan-Smith was picked out by a cross just two yards from goal, but – somehow – managed the impossible and blazed his shot wide. Morgan-Smith didn’t dwell on that miss though, when he produced a good run and picked out fellow substitute Jon Boyle with a low ball. It was more of a case of off the boil for the Telford man though, as he drove his low shot wide with the goal at his mercy. Spartans broke through Dale – with the game entering added time at the end of the second half – and the Blyth captain played an inviting ball to Jarrett Rivers, who appeared to have tapped in from close range. Bramley saved brilliantly to deny him, before spreading himself even more impressively to keep out the rebound from a waiting Maguire. Bradley Fewster also went close a couple of minutes later, before Croft Park erupted in cheers when the final whistle brought an end to a thoroughly entertaining Manarama National League North encounter. Blyth Spartans: Jameson, Nicholson, I Watson, Green (Horner 74), Buddle, J Watson, Wrightson (Rivers 78), Reid, Maguire, Holmes (Fewster 83), Dale. Subs not used: Cunningham, Skirpan. AFC Telford United: Bramley, White, Cockerill-Mollet, Deeney, Sutton, Streete, Cowans (Boyle 57), McQuilkin (Dawson 71), Barnes-Homer (Morgan-Smith 57), Udoh, Knights.